What do you cook when Bocuse, Gagnaire and Keller come to lunch? Happily, that wasn't my problem, I was just wall decoration that day. Unhappily for the people who had to cook that lunch, those three names were just the beginning. 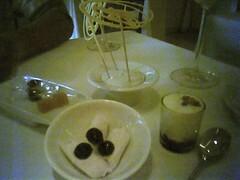 The list, yes that list, went on and on, Phillipe Legendre, Heston Blumenthal, Tetsuya, and so on. Yes, yes, that's the same list I was making fun of last year. And it is still just as semi-random as the years before, everyone I've spoken to who actually was on the list thought so themselves. I mean, how do you take seriously a list that combined a place like Cal Pep and elBulli? I am not arguing that Cal Pep is not worth it or anything, but they and elBulli are so different as to be simply incomparable. This apple is better than this orange, anyone? Anyway, the list was certainly good for a few things. 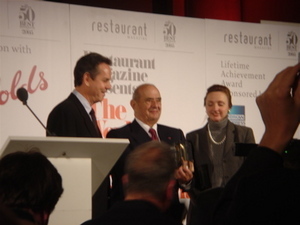 Everyone on it was unmistakably happy to be there, and especially so because it was a great excuse to party, and in the company of the likes of Paul Bocuse no less! The list was also quite a PR gold mine for the young Restaurant magazine, who somehow managed to entice almost half the chefs on the list to join in the celebration in London. That in itself was quite a PR coup, you know, London in the cold and the rain in April can be positively dreary. Amy tagged me with this book meme that is making a round on food blogs. It's, apparently, her devious way to get me to blog more often. I guess it works. ;-) Thanks Amy. Far too many. Oh, wait, no, one can never have too many books. Just lots and lots, then. Two actually, Paris, l'instant and Quiproquo, both by Phillipe Delerm. I am on a Delerm kick at the moment, to work on my French and also because I adore his style. His prose is gorgeous and precise. He somehow manages to use absolutely no superfluous words, even while being meticulously descriptive. In many ways the writing reminds me of beautiful photography, in the way that it grabs on to a fleeting moment or something seemingly unimportant, and recounts each in painstaking details. Like an excellent photograph, his stories invite -no, demand- participation from the part of the readers. Paris, l'instant is a perfect book to keep in your bag while flaneuring in Paris. Its tiny size will add hardly any weight to your already heavy bag, loaded with your Plan, your travel journal, your digital camera, your hat, your umbrella, your bottle of Evian, and all things a true flâneur could ever need. Plus, the subject matter is true to Phillipe Delerm's style, that is to say focusing on seemingly mundane matters, and even better this time since they are about all things Paris. Each story will direct your attention to minuscule yet astonishing delights that you may otherwise overlook. A little tired from an aimless wander, look around for a nice spot at a sidewalk cafe, order un petit café or chocolat, take out your Paris, l'instant and let your eyes do the flaneuring while your feet take their well-deserved rest. A great example that chain stores are not always bad, Le Pain Quotidien, with five shops in Paris alone, is always a lovely place to drop by for a quick tartine or a slice of something sweet and fruity. 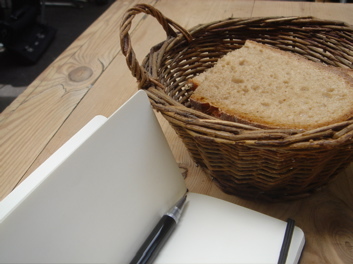 I am particularly attached to the one in the Marais, where you can find a table out on the wide sidewalk and while the day away, reading, writing, while drinking a nice little cup of coffee or munching on something yummy. 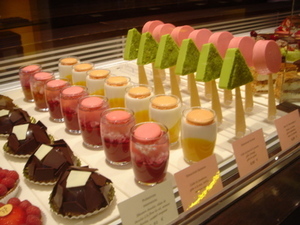 There are quite a few things new on offer today when I went by Pierre Hermé's patisserie on Rue Bonaparte. Two new macaron flavors: Campari et Pamplemousse and Pistache "Arabesque". I didn't like the Campari one much, finding the cream in the middle a little bit pasty. The Pistache "Arabesque", on the other hand, was fantastic. The biscuit had crumbled pistachio sprinkled on top, and inside was a delicious cream of apricot, with a mini dish of apricot confit and crispy praline hiding in the middle. This is going on the list of my all time favorite hall of fame, right there with the Caramel au fluer de sel. And as though the real Ispahan wasn't enough of a treat, there is a brand new incarnation of Ispahan, in a gorgeous glass with layers of raspberry gelée, rose gelée, and litchi bits, topped with a rose biscuit. 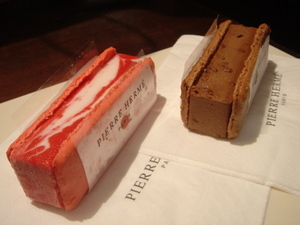 The complete flavor profile of his famous Ispahan, but in an entirely different presentation. I didn't get to try it, because I was on my way somewhere so I only got macarons to munch on the way. I'll get back there to try it soon. Today marks my time back on the wagon. Sitting at a table on the sidewalk sipping a coffee after lunch today, my little notebook out and a new pen, I'm getting back into writing again. Well, it's not that I haven't been writing, but my notes have been rather disconnected and meandering. It's time to get back to doing something a little more coherent. See you here, almost every day now, I hope. Looks like I've forgotten I had a blog! Sorry, I really will catch up soon. In the meantime I've put up a bunch of photo slide shows on Flickr. You might want to check them out. Haven't got time to write up that intriguing meal properly yet, so here are the photos for your pleasure for now. I'll tell more about the meal soon. thanks so much guys. I am all sorted now. Hertz came to the rescue.